To Cite: Shamsi M B . Correlation Between SLR and Active Knee Extension Tests in LBP Patients with Tightened Hamstring, J Clin Res Paramed Sci. 2019 ; 8(1):e87237. doi: 10.5812/jcrps.87237. Background: The length of the hamstring muscle is measured indirectly. This evaluation can be done by doing the passive straight leg raising (SLR) test or performing an active knee extension (AKE) test. It is important to know how much these two tests are correlated to each other. If they are highly correlated, a high SLR degree may conclude a high amount of AKE. Objectives: The aim of this study was to determine the correlation between these two tests among patients with LBP having tightness in their hamstring muscle. Methods: The sample size was calculated to be 50 patients. Participants with chronic low back pain (LBP) and short hamstring were selected. The hamstring muscles length of the participants were assessed using two clinical tests, 1- AKE test, and 2- SLR test. Results: The mean ± SD of the hamstring length of the patients using the SLR method was 72.52 ± 10.32 degrees. Also, the mean ± SD of hamstring muscle length was 157.28 ± 7.70 degrees using the AKE test. There was a positive and significant correlation between Hamstring length score using SLR and Hamstring length in patients with AKE test (P < 0.05, r = 0.30). Conclusions: The results of this study showed that there is a correlation between the results of two types of testing hamstring muscle length including SRL and AKE tests among patients with LBP having tightness in their hamstring muscle. Low back pain (LBP) is one of the most common physical problems among people. Most cases of LBP are non-specific that there is no specific cause for the pain (1, 2). More than 80% of people develop at least once in their lifetime with LBP (3). Several studies have suggested various risk factors for LBP such as obesity, cigarette smoking, long-term sedation (4, 5). Tightness of hamstring muscle is also a risk factor for LBP. Because hamstring tightness is commonly reported in these patients, it is assumed that a short hamstring can disrupt hip and lumbar biomechanics and ultimately lead to back pain (6, 7). The length of the hamstring muscle is measured indirectly. This evaluation can be done by doing the passive straight leg raising (SLR) test or performing an active knee extension (AKE) test. To measure the length of the hamstrings, Gajdosik et al. preferred the AKE test method compared with the SLR. It is because this test has a very high reliability. It is safe and the person dictates his/her end of rang (8). To assess the AKE test, standard (universal) goniometer is used (9), which is inexpensive and available, and to evaluate the hip angle in the SLR test, an inclinometer is used. The AKE test was designed to eliminate the limitations on the SLR testing requirements. Limitations include cases such as whether the constraint at the end of the range is muscular or neurological and the remarkable pelvic rotation that occurs during performing the SLR test and the effect that this movement may have on the validity of the test (10). Some studies have shown the correlation between these two tests in normal subjects (10). The aim of this study was to determine the correlation between these two tests among patients with LBP having tightness in their hamstring muscle. This was a cross-sectional study. This work was a part of another parallel, double-blinded, randomized, controlled clinical trial. It was undertaken in Kermanshah University of Medical Sciences (with the identification No. kums.rec.1395.169 in the Research Committee of Ethics at Kermanshah University of Medical Science). Because the present article was part of another clinical trial with variables that were related to EMG signals of tightened hamstring muscles, the sample size was calculated based on a relevant study conducted by Meroni et al. (7) to be 50 patients. Participants with chronic low back pain (LBP) and short hamstring muscle referring to Kermanshah University of Medical Sciences Clinic by an experienced physiotherapist were selected. Inclusion criteria were signing the informed consent form and having obvious shortness of hamstring muscle in the clinical examination and in conducting the SLR test. Exclusion criteria were orthopedic and neurological disorders, history of lower extremity hamstring damage in the past year, diseases such as arthritis, ligament and meniscus damage, and history of spinal surgery. The hamstring muscles length of the participants were assessed using two clinical tests, 1- AKE test, and 2- SLR test. To perform this test, each subject was in supine position; putting his head and neck on a small pillow (11). Then the legs and thighs of the other lower limb were fixed to the bed using straps. Using a pen, the knee flexion axis was marked and from this point, two lines were being drawn, one to the greater trochanter of the femur and another to the external malleolus of the ankle (fibula). These lines were used to measure knee joint angles. The goniometer axis was placed on the knee axis and its one arm was placed along the line drawn on the thigh and the other one was placed along the line drawn on the leg. Using a horizontal crossbar placed on two wooden legs which were on the sides of the thigh, the vertical position of the thigh and 90° of flexion in hip joint were maintained. Keeping the ankle in a neutral position, the subjects were wanted to extend the knee joint actively and slowly within 3 seconds as far as he could (12). Then when the active knee extension movement was completed and the participant was trying to keep this situation for a while, the angle showed by the goniometer was the extension angle of the knee joint (Figure 1) (11). Subjects were placed in a supine position with the hip joint in 0° of flexion. The thigh was fixed to the table by a Velcro strap. An inclinometer (INSIZE.CO.LTD) was attached over the distal tibia and the subject's leg was raised passively, causing the hip more flexed. During elevating the leg, the knee was kept straight. The pelvis was secured using another Velcro strap. We noted whether the end-feel was abrupt or gradual; if gradual, the force continued gently as long as the pain was slight so as not to miss a painful arc, beyond which motion can continue without pain. At the point of the most hip flexion, the maximum angle (degree) showed from the inclinometer was written as SLR score (Figure 2). Data were analyzed using SPSS software (version 21). Descriptive statistics including frequency (percentage) and mean (standard deviation) were used to describe the variables studied. Pearson correlation test was used to determine the association between two tests for assessing length of hamstring muscle in LBP patients. P value less than 0.05 was considered significant. The mean age of the patients was 37.73 years and ranged from 19 to 59 years old. Sixty-eight percent of the patients were male and 32% were female. Other patient characteristics are shown in Table 1. Abbreviations: BMI, body mass index; LBP, low back pain. The mean ± SD of the hamstring length of the patients using the SLR method was 72.52 ± 10.32 degrees. Also, the mean ± SD of hamstring muscle length was 157.28 ± 7.70 degrees using the AKE test. There was a positive and significant correlation between Hamstring length score using SLR and Hamstring length in patients with AKE test (P <0.05, r = 0.30).The scatter plot of these data is presented in Figure 3. The results of this study showed that there is a correlation between the results of two types of testing hamstring muscle length including SRL and AKE tests among patients with LBP having tightness in their hamstring muscle. The AKE and the SLR are two of the most commonly used tests, which assess flexibility of hamstring muscle (8). Some authors prefer the SLR for its passive nature believing that it has an advantage to the AKE test (13). However, others believe that the specific body positioning during AKE testing not only prevents pelvic rotation but also removes the confusion that neurological involvement may occur during doing the SLR test (14). To assess hamstring muscle flexibility, the AKE test is now considered as the gold standard (15). Gajdosik et al. in their study found a significant negative correlations between the SLR and the knee extension (active and passive) tests (8). It is similar to our study in having correlation and is different from ours as the correlation in our study is positive and unlike our study, the subjects were healthy individuals. He thinks that the AKE is an active test and represents the hamstring length that is different from the passive tests such as SLR. Cameron and Bohannon in another study (10) found a significant relationship between AKE and active SLR. The similarity of this work to ours is positive correlation and the difference is that the SLR was active test type, whereas our test was performed passively and also unlike our study, the subjects were healthy individuals. The authors presented some explanations for why the magnitude of the correlation between the two tests was not so high. One reason was the inconsistency in the angle of hip flexion while performing the AKE test. Although the amount of hip flexion was measured before doing the AKE test, checking this joint later revealed that this angle was mostly off by up to 5°. A second reason was that the subjects were usually unable to keep the knee fully extended during doing the active SLR. In spite of the asking the subjects to keep their knees extended, some degrees of knee flexion was still found in most subjects. A significant correlation between AKE and SLR results was found in another study of Neto et al. The subjects in this study were healthy people with flexibility deficits and the SLR was active type test. These authors presented this explanation for the variability between the tests that the AKE is an active test and the subjects do the movement toward the end of range, whereas SLR is a passive test and the movement is ended by the assessor (16). They also state that asymmetries in a subject’s pelvic position while doing the AKE test justifies the significant differences in the final popliteal-angle outcome. They believe that the pelvic position’s influence on SLR test is even greater in subjects with flexibility deficits because hamstrings with low extensibility may cause a posterior pelvic tilt that may increase the variability between the AKE and SLR results (16). To our knowledge, no study has investigated the correlation between AKE and SLR tests among patients with LBP having tightness in their hamstring muscle. Regarding previous studies that show a good correlation between these two tests among healthy individuals, it seems that for those people with LBP and tightened hamstring, also the correlation is good. SLR is easy to do and is widely used by clinicians. AKE needs putting patients in a special position and so is more difficult to perform, but is more valid. So both test are useful and practical and the conditions define which one is preferred. In people with tightened hamstring, especially LBP patients, both SLR and AKE can be used to assess the length of muscle. Regarding the situation of patient, one of these tests should be selected. Authors' Contribution: Mohammad Bagher Shamsi designed the original idea, designed the research and methodology, conducted the data acquisition and wrote the manuscript. Ethical Approval: This study was approved by the Ethics Committee of Kermanshah University of Medical Sciences (reference number: kums.rec.1395.169). Financial Disclosure: The authors affirm that they have no financial affiliation (including research funding) or involvement with any commercial organization that has a direct financial interest in any matter included in this manuscript. Funding/Support: Funding was supported by Kermanshah University of Medical Sciences (reference number: 94217). Patient Consent: All study participants gave full informed written consented to take part. 1. Balague F, Mannion AF, Pellise F, Cedraschi C. Non-specific low back pain. Lancet. 2012;379(9814):482-91. doi: 10.1016/S0140-6736(11)60610-7. [PubMed: 21982256]. 2. Meucci RD, Fassa AG, Faria NM. Prevalence of chronic low back pain: Systematic review. Rev Saude Publica. 2015;49. doi: 10.1590/S0034-8910.2015049005874. [PubMed: 26487293]. [PubMed Central: PMC4603263]. 3. Baillie L, Bacon CJ, Hewitt CM, Moran RW. Predictors of functional improvement in people with chronic low back pain following a graded Pilates-based exercise programme. J Bodyw Mov Ther. 2019;23(1):211-8. doi: 10.1016/j.jbmt.2018.06.007. [PubMed: 30691755]. 4. Shrier I, Ehrmann-Feldman D, Rossignol M, Abenhaim L. Risk factors for development of lower limb pain in adolescents. J Rheumatol. 2001;28(3):604-9. [PubMed: 11296967]. 5. Kennedy C, Kassab O, Gilkey D, Linnel S, Morris D. Psychosocial factors and low back pain among college students. J Am Coll Health. 2008;57(2):191-5. doi: 10.3200/JACH.57.2.191-196. [PubMed: 18809536]. 6. Massoud Arab A, Reza Nourbakhsh M, Mohammadifar A. The relationship between hamstring length and gluteal muscle strength in individuals with sacroiliac joint dysfunction. J Man Manip Ther. 2011;19(1):5-10. doi: 10.1179/106698110X12804993426848. [PubMed: 22294848]. [PubMed Central: PMC3172951]. 7. Meroni R, Cerri CG, Lanzarini C, Barindelli G, Morte GD, Gessaga V, et al. Comparison of active stretching technique and static stretching technique on hamstring flexibility. Clin J Sport Med. 2010;20(1):8-14. doi: 10.1097/JSM.0b013e3181c96722. [PubMed: 20051728]. 8. Gajdosik RL, Rieck MA, Sullivan DK, Wightman SE. Comparison of four clinical tests for assessing hamstring muscle length. J Orthop Sports Phys Ther. 1993;18(5):614-8. doi: 10.2519/jospt.1993.18.5.614. [PubMed: 8268964]. 9. Radwan A, Bigney KA, Buonomo HN, Jarmak MW, Moats SM, Ross JK, et al. Evaluation of intra-subject difference in hamstring flexibility in patients with low back pain: An exploratory study. J Back Musculoskelet Rehabil. 2014. doi: 10.3233/BMR-140490. [PubMed: 24968796]. 10. Cameron DM, Bohannon RW. 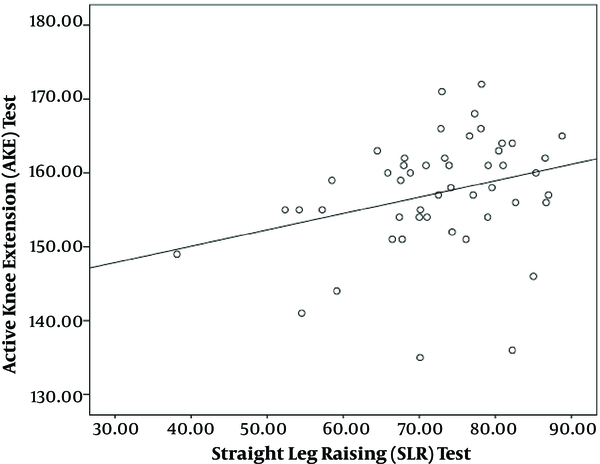 Relationship between active knee extension and active straight leg raise test measurements. J Orthop Sports Phys Ther. 1993;17(5):257-60. doi: 10.2519/jospt.1993.17.5.257. [PubMed: 8343784]. 11. Kim CH, Gwak GT, Kwon OY. Reliability of the active knee extension test with a pressure biofeedback unit. Phys Ther Korea. 2017;24(3):40-6. doi: 10.12674/ptk.2017.24.3.040. 12. Nelson RT, Bandy WD. Eccentric training and static stretching improve hamstring flexibility of high school males. J Athl Train. 2004;39(3):254-8. [PubMed: 15496995]. [PubMed Central: PMC522148]. 13. Ayala F, Sainz de Baranda P, De Ste Croix M, Santonja F. Criterion-related validity of four clinical tests used to measure hamstring flexibility in professional futsal players. Phys Ther Sport. 2011;12(4):175-81. doi: 10.1016/j.ptsp.2011.02.005. [PubMed: 22085711]. 14. Gajdosik R, Lusin G. Hamstring muscle tightness. Reliability of an active-knee-extension test. Phys Ther. 1983;63(7):1085-90. doi: 10.1093/ptj/63.7.1085. [PubMed: 6867117]. 15. Davis DS, Quinn RO, Whiteman CT, Williams JD, Young CR. Concurrent validity of four clinical tests used to measure hamstring flexibility. J Strength Cond Res. 2008;22(2):583-8. doi: 10.1519/JSC.0b013e31816359f2. [PubMed: 18550977]. 16. Neto T, Jacobsohn L, Carita AI, Oliveira R. Reliability of the active-knee-extension and straight-leg-raise tests in subjects with flexibility deficits. J Sport Rehabil. 2015;24(4). doi: 10.1123/jsr.2014-0220. [PubMed: 25364856].